Is 'Rush Hour 4' in the works? 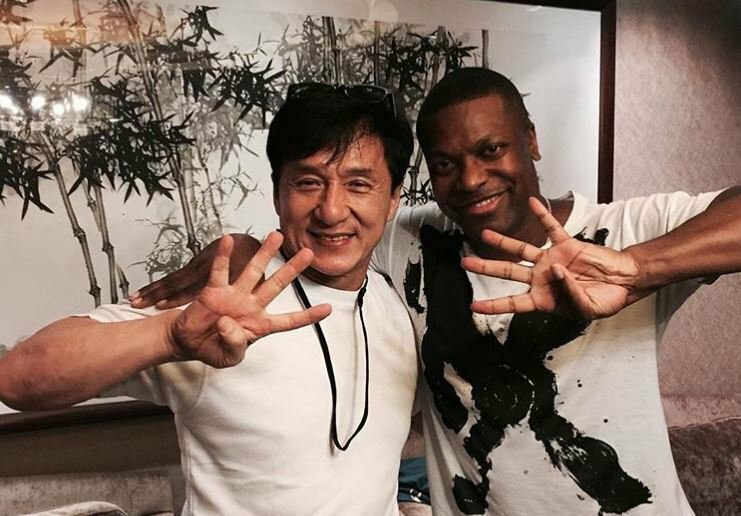 Is this picture proof that Jackie Chan and Chris Tucker are planning 'Rush Hour 4'? Jackie Chan and Chris Tucker just hinted that 'Rush Hour 4' is a real possibility. Chris took to Instagram over the weekend to celebrate Jackie on his 65th birthday. "Today is Jackie's birthday. I want to wish my boy Jackie Chan a Happy Birthday!!" he captioned a picture of the two of them together. The 47-year-old posted another image with Jackie. The picture showed the men holding up the number four. His one-million followers took that as a sign that 'Rush Hour 4' was a done deal. "Does that mean its really happening? I [have] been waiting so long for this!!" one fan wrote. Some of Chris' famous fans were also excited about the possibility. Rapper Chance The Rapper wrote: "Please be serious." It's not the first time Chris has hinted that the fourth instalment is on its way. Speaking on the 'Winging It' podcast earlier this year, the actor said they were trying to put something together. “It’s not in pre-production. We’re working on a few things [for] the script. Jackie wants to do it. I want to do it. The studio wants to do it,” Ebony.com quoted him as saying. Jackie also got fans excited in 2017. "[It’s coming] next year. For the last seven years, we’ve been turning down the script, turning down the script. Yesterday, we just agreed," he told Power 106 Los Angeles.